Samuelsohn was founded in 1923 by Lesser Samuelsohn. He was a clothing designer who believed in fine tailoring; a fanatic about quality and detail. He was determined to produce the finest men’s clothing, and he did – without compromise. Today, all Samuelsohn tailored clothing is still proudly hand-tailored in Montreal, Canada, with the same passion and commitment to excellence they have had for over 94 years. In a world of wavering standards, when it comes to Samuelsohn clothing, they don’t believe in compromise. Bob Weakley, Samuelsohn’s representative, will be in the store to help you with model, fabric selection and fit. During the day, enjoy a 15% savings on any garment purchased from stock or special order. Trunk show offer expires Saturday, April 20th. 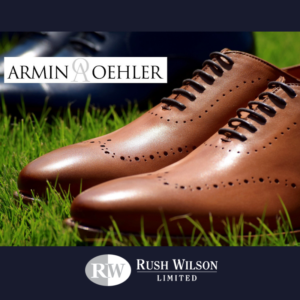 Headquartered in Greenville, SC, Armin Oehler, the youngest son of the 6th generation of a luxury leather supplier in the Stuttgart area of Germany, designs and engineers classic men’s shoes with premium leather from the family’s tannery while adding Southern sensibility with a modern European feel. Armin will be in the store all day to help with your selection and fit. Receive a gift with purchase from this new up and coming shoe company. Measure Up Custom Shirts – Buy 5 and get the 6th for free. Are you wearing a shirt that makes the most of your individual physique? For example, did you know the staff at Rush Wilson Limited will help you choose a collar shape that best fits the contour of your face? You may also customize cuffs, pockets and monograms, shirt tail length and each sleeve length (yes, most people have arms of different lengths). Our job is to help you select fabric, style and detail that will make every shirt a pleasure to wear. Your job is to enjoy looking and feeling great! Our experienced staff will be ready to help with model, fabrics and fit. We will also have a selection of fabrics at a special value to be made into custom shirts. Please call us for an appointment so we may offer you our undivided attention. A special offer for you: when you order 5 shirts, you will get the 6th shirt free! Trunk show offer expires Saturday, April 20th.